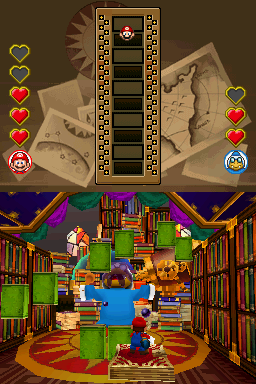 Book Bash is a boss minigame against Kamek in Mario Party DS. The minigame is played similar to Space Harrier, as the player must survive a flight down the hallway while taking out the henchman and avoid running into bookcases that randomly pop out to hit the player. After getting past the books, the player must use their ink pen to shoot Kamek in the face until he gets inky and cannot see (The player gets 5 Health Points and Kamek has 3.). He will shoot his magic in every direction causing a book to fly down and hurt himself. After that, the player has to avoid the book so they don't get hit as well. However, Kamek attacks by summoning books randomly to attack the player and firing magical blasts from his wand. Kamek also has a few defensive moves as well. He can move left and right to avoid some ink blobs and he can wipe his face to get some of the ink off. After three hits, a giant book falls on top of Kamek, knocking him out. Rules – "Survive a flight down Kamek's library hallway, then take on the henchman. Shoot ink blobs at Kamek's face until he's totally inky!" Tips – "Flying books and sliding bookcases will keep you on your toes. So keep an eye out for surprises on your way to fight Kamek." This page was last edited on March 15, 2019, at 00:33.